This site guide provides access to course descriptions, activity examples, and visualizations for teaching Plate Tectonics. 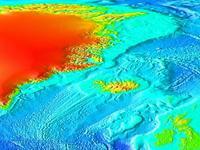 It also provides access to collections that focus on teaching plate tectonics with data. Click the images above to browse teaching activities and course descriptions related to Plate Tectonics. Collections are contributed by faculty and may include service learning projects, writing assignments, field trips, course descriptions and syllabi. 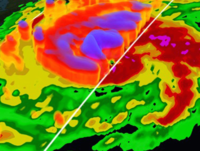 Major research frontiers, grand challenges, and thorny problems in structural geology, geophysics and tectonics - Incorporating major research frontiers into undergraduate courses affords the opportunity to illuminate how science is done, along with the excitement of topics around which a community consensus has yet to emerge. 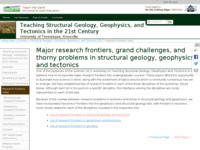 These pages provide lists of major research frontiers in three disciplines--structural geology and tectonics; geophysics and tectonics; and geodesy. Plate Tectonic Movements Visualization Collection - This large collection of visualizations includes simple animations, GIS-based animated maps, paleogeographic maps and globes, as well as numerous illustrations and photos. MARGINS Mini-lesson Collection - The MARGINS project focuses on understanding processes governing the evolution of continental margins. MARGINS Mini-Lessons are modular learning materials that repurpose the data resources, visualizations, and other information sources developed through MARGINS and MARGINS-related research for use in examining fundamental earth processes in undergraduate classrooms from a multidisciplinary perspective. Teaching with Data, Simulations, and Models - This collection of pages provides resources to help faculty use data, simulations, and models effectively and easily, and contains access to teaching materials and tips from the classroom and literature about the supporting pedagogy. 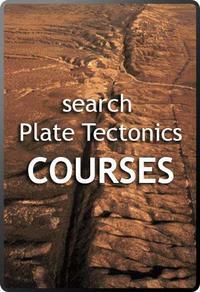 It includes ideas for teaching as well as offers a collection of about 30 data sheets (a data sheet concisely describes a particular scientific data set in a way that is useful to educators interested in teaching with the data set) and a section on tools useful for simulations, several of which involve plate tectonics. 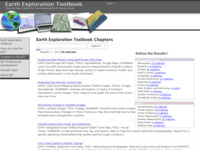 The Earth Exploration Toolbook - The Earth Exploration Toolbook has a number of data-rich activities designed for high school classrooms including Analyzing Plate Motion Using EarthScope GPS Data and Evidence for Plate Tectonics. 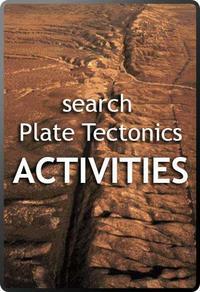 The site browse will give you a complete list of plate tectonic related activities.